You can remove an ECS instance from one of its security groups as needed. If an instance is removed from a security group, it can no longer communicate with other instances in that group over the intranet. Therefore, we recommend that you conduct sufficient tests before the removal to ensure that your business runs normally after removal. The ECS instance has been added to two or more security groups. 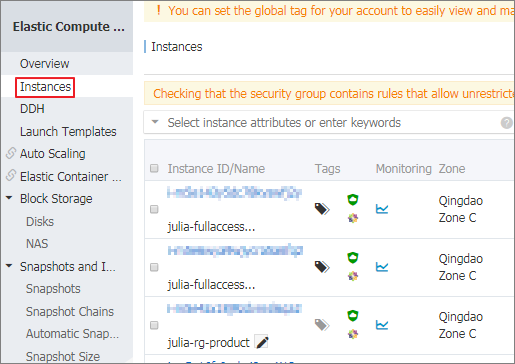 On the Instances page, find the target instance, and then click Manage in the Actions column. In the left-side navigation pane, click Security Groups. Find the target security group, and then click Remove in the Actions column.